Kolkata: Top Indian golfer SSP Chawrasia has lashed out at the Indian Olympic Association and Sports ministry for not yet receiving the full amount of promised Rs 30 lakh earmarked as preparatory money for the Rio Olympics. Both Chawrasia and fellow golfer Anirban Lahiri are yet to receive the allocated amount from the Sports ministry. A livid Chawrasia termed the shoddy treatment by IOA officials at the Rio Games as if they were "servants". It has been four months and they have had several paperworks done but Lahiri, a winner of 16 titles around the world, was not even paid a penny, while Chawrasia himself managed to get Rs 5.5 lakh so far, Chawrasia told reporters. "I have the letter where they promised to reimburse up to Rs 30 lakh. 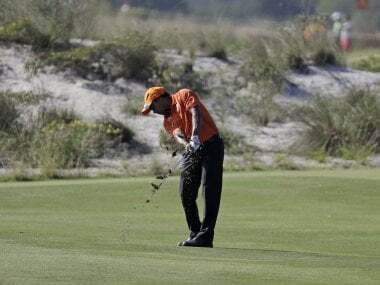 But post-Rio we're told that the amount is reduced to Rs 15 lakh," fumed Chawrasia, who won the Hero Indian Open and Resorts World Manila Masters this year. Asked about horrible experience at Rio, Chawrasia vented his ire at IOA officials. "There were no proper arrangement right from vehicle arrangement. It was freezing cold and kept raining and they did not even arrange an umbrella or raincoat for us. They would behave as if they were 'maalik' (owners) and we were their 'naukars' (servants)," Chawrasia claimed. "We were asked to wait at the airport for four hours for a vehicle and Lahiri came on his own. We were feeling so bad. Now we will think twice before representing India at Olympics. We don't like to keep on harping on this subject as we want to concentrate on the tougher assignments ahead," he added. Highlighting the payment issue, he said the sports ministry in a written communication had promised the amount of Rs 30 lakh towards their expense incurred in Rio and also for the coaching camps they attended in the build-up to the Olympics. "Lahiri has not got anything yet and was told that he has missed the deadline to submit the papers. It's only because of a friend of mine, who made rounds of the office in Delhi for several days to submit the bills, that I could get Rs 5.5 lakh." Chawrasia however said there's a ray of hope as a few days back was an e-mail that has come from the ministry asking him to submit the details again. "I hope it's sorted now," he signed off.